It’s time for Christmas tree garland decoration! Right about Thanksgiving afternoon, turkey and stuffing in my stomach, is when I start getting in the Christmas spirit. Try these unique DIY Christmas garlands that are sure to make your house and Christmas tree look fantastic! Really cool earthy idea that could spruce up your holiday mantelpiece. Try it today. Holiday decorating is in full swing! We love Christmas décor but usually try to keep things modern and simple. This DIY paper-tree garland is easy to make and would be fun project to work on with the kiddos! In essence, the strands are oversize wood balls on a string that you can use to decorate a shelf, style a coffee table, etc. Because of their size and shape, they add texture and movement to a vignette. And during the holidays, they can double as a beautiful garland. On their own or tucked in pine, they bring a rustic modern element to your decor. I love that pom-poms seem to be everywhere these days, and I looked for a pom-pom garland to help soften up my rustic Christmas tree. By it at the store and it’ll cost you an arm and a leg. Luckily there’s a way to get the look without breaking the bank! A simple to follow tutorial of how to fold an origami star and make a beautiful star garland. Perfect as a DIY Christmas decoration. Looking for an interesting, natural or rustic addition to your Christmas decor? Birch Bark Paper Garland is super easy to make with a huge wow factor! While walking through Target I came across these oversize jingle bells labeled ‘vase filler’. Instead of the intended purpose, I decided to string them up for a simple garland to hang across the studio window. When it comes to holiday decorating, Jessi likes to come up with a fresh, new take on last year’s decorations—it’s a fun way to repurpose embellishments you already own. For this project, Jessi’s turned my strand of red and white felt balls from last year’s Christmas tree into a festive garland of holly to drape over a mantel or wall. Make this easy DIY felt christmas tree garland in 4 simple steps! 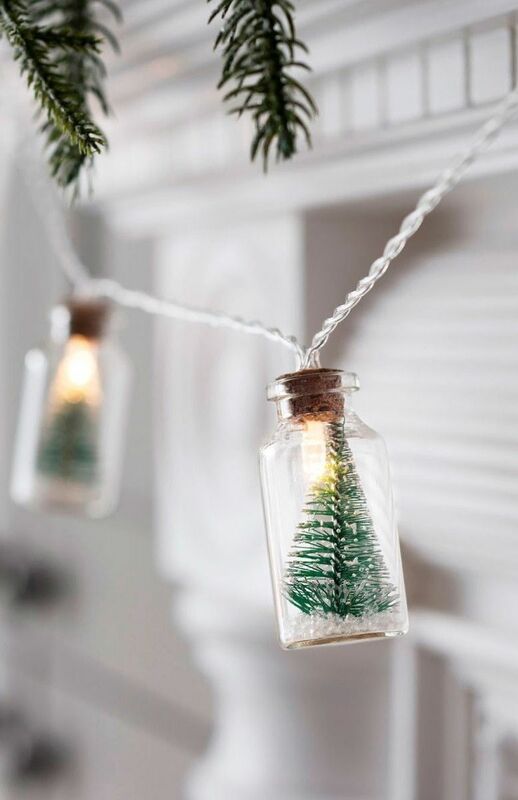 Get that modern, scandinavian feel in your holiday decor with this cute project. This year Pinja wanted to make a piece of Christmas decoration inspired by the Finnish traditional Himmeli, which is an ornament made of straw and is hung form the ceiling at Christmas time. They wanted to keep it natural and simple by using the straw and wooden beads that they decorated with a little bit of white paint. The ornament hangs now on our tiny Christmas three but after Christmas it could still stay around somewhere in the house. This faux greenery garland took only a few minutes to make but saved tons of money and adds rustic, farmhouse charm to any season. With the holidays around the corner, it’s time to start thinking about how you will decorate your home. This year, why not try making a nature-inspired garland using pine cones from your yard, nearby trees or even from a craft store? Learn how to make your own DIY Button Garland for your Christmas tree. This garland give the look of having a popcorn garland on your tree witout the mess! The beauty of this easy DIY decoration is you can put it up now and keep it up through the holidays and well into the New Year. Want to decorate for the holidays, but short on time? These easy DIY Christmas decorations will save the day! Easy and quick, you’ll be done in no time. Once you see how beautiful a Christmas tree can look with burlap garland, you won’t be able to resist decorating your own tree with it! I must say there is something where after you’ve had that delicious Thanksgiving dinner, that good old fashioned Christmas spirit feeling comes in full force. Get started with this beautiful staircase garland for your railing. Make salt dough ornaments to use for the tree or garland in these easy steps! Involve the kids, its such a fun activity just in time for Christmas. While largely intended to jazz up your holiday decor, this garland would be lovely to use throughout the winter months. Mine took up residence along the mantle in the living room, but really it would be adorable just about anywhere in your home. So who’s ready to get your gold leaf on? I like them because they are pretty and girly and sometimes as a mom of two boys, you really need something feminine. But what I love most is that I can touch them and they will be around as long as my memories will. Garlands made out of fabric will last through years of celebrations. Turn the plain ol’ strings of balloons into Christmas light garlands! It’s super fun wrapped around the tree with the balloons as a “topper” but it would also make fun decor for just about any Christmas celebration. Book Page Paper Feathers: using old book pages, a glue stick and a wire for a center make beautiful feathers to use as a garland, gift topper, or Christmas tree ornament. Make it festive by adding gold glitter. Easy Holiday DIY. Need help hanging your garland for the first time? Don’t worry! Even with our limited knowledge, we can help you make your room look just as fabulous as ours. If collecting things comes as a natural instinct to you, then maybe you’ll love this foraged garland from different branches and shrubbery! Check it out!